Surrounded by her new friends, Phone and Pod - um, iPod, not this Pod. Thanks, Roxie, for the naming inspiration...I ended up going with Heliotrope because it sounds southern and is a version of purple, and Lucre for the filthy lucre that she was purchased with! As I didn't get her on Tuesday (long story, you don't wanna know! ), I haven't had the chance to take her out on the town yet for a more formal photograph. For the moment, this will have to do...and as my friend Kathleen observed when we were having lunch the other day, the color will match my phone...and as it turns out, my iPod case as well! So even though pink was and probably will always be my first choice of colors when it comes to almost anything (maybe not a car), I guess purple was a good second choice. I recently finished reading The Help by Kathryn Stockett - it was one of the best books I have read in a long time! I loved the characters and the story, although at times it was hard to read, as it covers an era in the deep South when there were distinct racial barriers - but everything about this book was so good. I also adored so many of her character names, and have decided to rename Kip and Henry, our cats...hey, it's not like they really respond to their names now, so why not? And it's better than my normal alternative, which would be to adopt more pets. I do not need that - it's hard enough to leave home already with the creatures that we have! So anyway, Kip is now Mae Mobley (yes it's a girl's name but he is kind of a sissy) and Henry is now Treelore. I didn't rename Paco because he actually does know his name. But if I were to, he would have been Aibileen. Seriously, if you haven't already, you should read this book. I wanted to buy a decorative hook to hang in my office so I could get my exercise tube off of the floor. Went to Pier One, where I found this cute wrought iron number for the bargain price of $2.00. Should have been a simple enough transaction, right? I brought it to the register, took out two dollar bills and some change (tax, you know), and waited for the cashier to ring me up. First he asked for my telephone number. I declined to give it to him (pretty sure he wasn't asking me for a date). Then he asked for my email. Again, declined. Then he told me that if I applied for a Pier One credit card and spent $500, I could have my entire purchase for zero interest for however many months (I wasn't listening at this point). Seriously??? All of this for a freakin' TWO DOLLAR item? No wonder the economy is in trouble - they don't make it easy to buy something! I swear, one more question and I would have left the hook, unpurchased, on the counter and walked out. Troublesome hook...but it does look good, no? Not only am I using the exercise tube a couple times a week for my regular at-home workouts, but I'm also making myself do exercises when I should be writing but end up dinking around on the internet too long...a self-inflicted punishment of sorts. But with benefits - stronger arms! So even if the writing isn't happening, at least I'm doing something good for myself. I went to my one of my favorite haunts, TJ Maxx, on Tuesday night. Found a couple of workout shirts and went to try them on. When I pulled off my top, I saw a red rash on the inside of my right arm, around the bicep. Right away, I had fat guilt. You know, when your clothes are too tight and you get a rash and it's all your fault because you are overweight? I can't be the only one who felt like I deserved this whenever it happened, right? But how did this happen? I was wearing a top that had loose sleeves. And my arms aren't that fat anymore. It was a mystery, until the next day when I was checking my WWU post for typos, and saw the black band of my iPod holder on my arm in one of the pictures - oh! That was it...and it must have happened because I ran in the rain - I've been wearing that thing for months now and have never had that issue. Whew! But wow, what a dreadful feeling to have. It sure brought back a lot of bad memories and all the crap that I put up with when I was overweight. Not trying to make light of this at all, but it felt a little PSTD, and sometimes? I wonder if I'll ever get past those feelings of unworthiness. Last Monday marked the end of Biz's 101 Days of Summer challenge, where my goal was to run for eight miles without stopping. That did not happen, not by a long shot - in fact, as I told her in my update, I actually ran shorter and shorter distances as the summer progressed! But, I'm still happy with my progress, because I actually kept up with exercising outdoors, in the heat and humidity, all summer long. I greatly underestimated just how hard it would be to run in that kind of weather. It's all good, though - I'm still running, and my miles are going back up. Glad she did this challenge, as it kept me accountable and moving all summer - so thanks, Biz! And now, it's time for Fashion Friday - A Tale of Two Jackets. You will recognize the white denim jacket as the one I bought while I was in California. 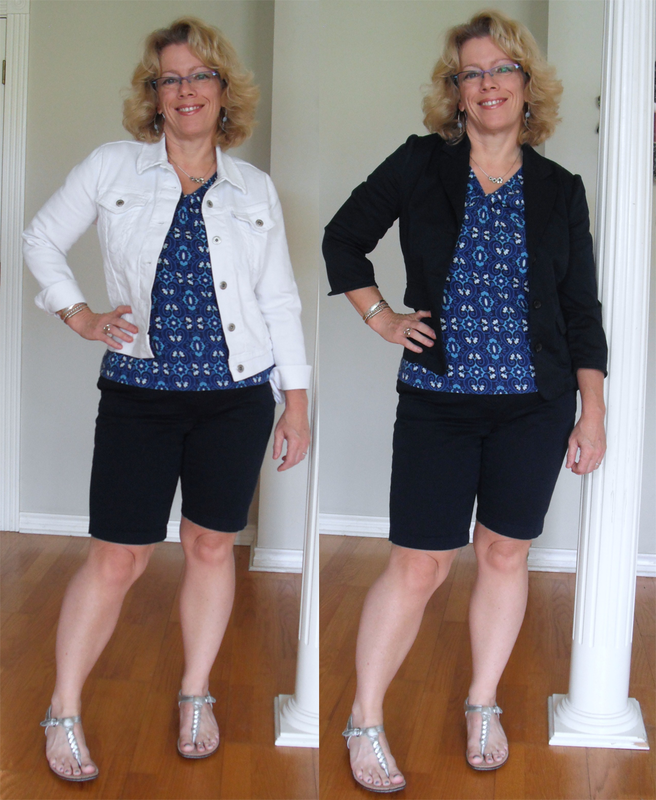 The blue one is a Banana Republic jacket that I bought at Goodwill over a year ago - it was in great shape, and I loved the style. However, it was too tight in the sleeves when I bought it - I think I was down about 75 pounds at the time. I figured that eventually it would fit, and kept trying it on every few months. I'll be darned if those sleeves always seemed tight! I was planning on bringing it out to California and giving it to Barbara, when I tried it on one last time...and what do you know - the sleeves finally fit! So I kept it - sorry, Barbara! Anyway, I wanted to wear it this week, but had a hard time making it work. Now that I see these pictures, it may have been too matchy-matchy with the color of the Bermuda shorts. Thanks to my son, Max, for making up these side-by-side pictures - one of these days I will have to learn how to do this for myself...but it's nice to be able to call on him for help, even if he does live three hours away! I felt W-I-D-E at the stomach with this shirt. Weird because sometimes I really like it. Not this time - did not end up wearing it. Pink! Love the top, but the solid color did not camouflage my stomach enough - and yes, I might have been a little ultra-sensitive, having just seen the previous pictures, but still, I have to feel good in my clothes, and this day, I was not feeling good in this top. Did not end up wearing it. An old print top from Kohl's - I liked the way I looked AND felt in it. This is the one I ended up wearing. But which jacket did I leave the house in? The white one. I'll have to retry the blue one with a different color bottom - maybe my lighter jeans or capris. I have to tell you, this whole "dressing" thing is not always easy! Alright, everybody, have a good weekend! a bleary one here so, even though Ive read and reread yer post, Im left with a mushy brain and the mere thought of how much I COVET COVET COVET the dell. did you know purple is my fave color? I hate that about Pier 1 - I have the same reaction. I love the name - perfect! I have a white jacket like yours and I wear the tail off of it. It just goes with so many things so very well. As a matter of fact, I may wear it today. Oh, and I love your cats new names - even if they don't. I haven't read that book, but am slowly easing myself back into reading. Oh, and my naming gift can some times go off the rails - my last two cats? Ricketts and Scurvy. 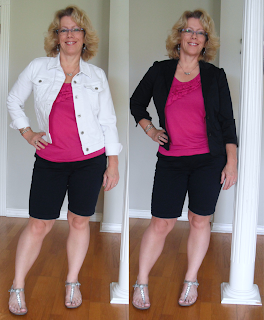 I personally prefer the second outfit on the right (with the pink shirt). Shelley you will be running that 8 miles in nowtime especially now you're in a running group! I've looked up the book and to my surprise I've seen it many times as it's in the top 10 bestsellers list in Holland for months now but never paid attention to it. Going to add it to my read wish list. Love your heliotrope trio. And the jacket success story. It's usually the arms with me too--the last to fit. I recently had a similar shopping experience at Sears - to the point where I said to the guy "DO NOT ask me one more question, do whatever you have to do to make the next words coming out of your mouth the total amount I owe!" He was stunned right into doing it. I read The Help when it very first came out. I agree it's a must read. Was going to ask you what sort of netbook you went with but you answered that with the photo. I will be relying on you to do all my research on that product so that's when it's time for me to buy my own you can tell me exactly what to purchase! I liked the last pic .. blue top with blue jacket. I thought the color synchronicity made your look a little longer. I too hate when I'm asked my phone number and all kinds of details to pay CASH for something. I've even been refused service one time because I refused to give up the info. Can't remember where. Congrats on the new toy. You deserve it! Have a great weekend! I know you can't see it when you're looking at pictures of yourself, but that one with the pink top and the dark shorts and dark jacket? You look AMAZING and completely slender. It's the best outfit on there. Oooh, love the new Dell! Way cool. I read The Help too and loved it! It's in my list of favorites now. If you haven't read a book in a long time, now is a good time to put those reading glasses on and give it a look. And I liked all the "jacket looks" myself, but I don't have a Barbie body like yours to dress...YET! Hooray for your new toy! Love how compact it is - you could probably just throw it in your purse! Love the modeling pics as usual - I do like the last shirt the best though! I had to laugh at changing the cats' names. Do we ever really call our pets by the name we gave them at first? They always end up with 10 different names. I read a lot of books. I thought The Help was the best book I read in 2009. Loved it enough to get the audio for the car. It was perfectly cast. I love fashion fridays! You are too cute! I love the pink electronics! They are feminine with a bit of sassy thrown in. And while I'm loving everything about your post, let me just say that I LOVE "The Help"! I read the book a few months ago and have read many books since then, but still tell people that "The Help" is the best book I've read in a long time. I also love that you re-named your cats! Thanks for the book recommendation. I have read excerpts from it but do not have the book. It is on my "list" for sure. Congrats on the new toys in such pretty colors. I had a great time participating in Biz' challenge too. I didn't meet all my goals but I made progress and that's all that really matters, right? I loved "The Help" too. It was such a great story and reminded me of Cane River. Have you read that one? I'm reading the second book in Diana Gabaldon's Outlander series but the best book I've read this year has to be The Book Thief by Marcus Zusak. You look beautiful in all those fashion photos. It's so nice when you can try clothes on and they FIT! CONGRATS! Oh you know I'm loving your new toy. Yesterday at Starbuck's with my bookbag I thought about you with your new notebook. And have to say I agree with your choice of outfits, although that weird feeling we get that a certain outfit does not look good--it really makes no sense sometimes. But I don't ever wear something that makes me 'feel' like that. I love that blue jacket though. The Help is a really good book. I've listened to it a couple of time, because I liked the way it was preformed. Love the dell. The name is great. Trust Roxie for a good name. Love all your looks. You look just amazing. That story about Pier One made me laugh! I fell for that trap in my 20's, taking every card that was offered to me...BAD MOVE! Now, I haven't used a credit card in like 8 years! They are all cut up! Love the jackets, too cute! and, your pink and purple accoutrements are stunning. 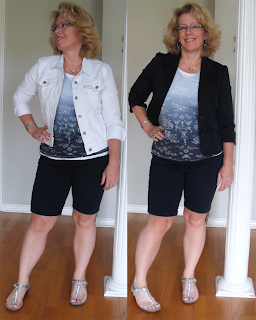 Yep, the blue patterned top with the white jacket was my favorite combo too! I love that you name your electronic gadgets. Hee!